Periodontal disease is dangerous in that it is often painless and symptom-less. 80% of Americans will be afflicted with periodontal disease by age 45, and 4 out of 5 patients with the disease are unaware they have it. It is important to maintain proper home oral care and regular dentist visits to reduce the risk of obtaining this disease. 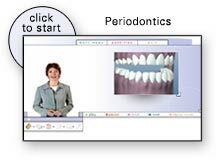 For a brief narrated overview of periodontics, please click the image on the right. It will launch our flash educational MiniModule in a separate window that may answer some of your questions about periodontics.